Garlic Scapes - a lot! Our row of Japanese turnips growing in greenhouse 1 is infested with aphids. This is something new for us. Sometimes we'll have some aphids in the Tango lettuce greens (one of the salad varieties we grow that goes into our Salad Mix), but I don't remember us ever having such a big infestation and causing such a mess. So, after repeated efforts trying to wash the aphids out of the leafy green turnip tops, I made the decision to cut them off. If we get another harvest of turnips again next week (there are still some "good" sections in the row), they will be topped immediately, and the leaves will go to the burn pile. This will hopefully isolate the little buggers and speed up our harvest and washing process. So now we are dealing with aphids in greenhouse 1. Sadly, this insect is known to stick around for a long time, but usually to a contained or specific location. People will ask me "How do I get rid of aphids?" And I'll tell them some of the methods I've heard will help (crop rotation, healthy soil, cleaning things up really good, tossing out anything that could be a hiding place for eggs, and similar ideas), but now it's our turn to fight off this invader! Shain will start with a heavy sprinkling of diatomaceous earth. He says we may need to order lady bugs. We moved our row covers outside to bake in the sun and I'll move other things out ASAP just to be safe. For the last week we've been working on clearning out two rows in this greenhouse so we could plant our last transplants, but now we are hesitant to plant anything near the infested row of turnips. Yuck! So, that's a lot of fun. I can tell it's really summer based on how quickly some of the crops are growing now. The garlic scapes are all ON at once! You are getting a large bunch of them. Remember, they will last several weeks if stored in a loose sack in a crisper drawer. It's possible you'll get some more next week, but if you are planning on doing anything special with your scapes, this week's batch is your opportunity. Other crops are growing well, and so are the weeds. We weed greenhouses early in the morning before it's too hot, then enjoy the cold water as we wash and package produce, and if time allows it's back to outside weeding. Repeat. Boc choi + Japanese turnips + garlic scapes ... You know what I'm thinking? Eggrolls! We have a few recipes (here and here) but honestly, I make each batch a little different depending on what I have on hand. SO GOOD! We are anxiously waiting for more foods to be ready to harvest for the CSA shares. We hope to have Chinese cabbage and boc choi soon (maybe 2 weeks?). The zucchini plants have blossoms. We'll start pulling some fresh garlic soon too (after the scapes are off). Lots of items just about ready, but not quite. It's pretty typical for us to see a jump in what we can harvest around the 4th of July. Seems like this year will follow that pattern. Garlic scapes are just starting to form. You are receving a small handful this week and you'll be getting a lot more over the next 2 to 3 weeks. This crops will only be availble for these few weeks, by nature of how the garlic plant grows, and then gone again until next year. Scapes store very well in a loose plastic sack in your refridgerator crisper, up to a month even. The entire scape is edible, but you'll want to discard any parts of the stalk that get "old" or "woody" (similar to how you cut off the end of asparagus) and some also prefer not to eat the blossom tip. Garlic scapes have become a much sought after item at Farmers Markets because they are so versatile. Our favorite recipe is Garlic Scape Pesto. We make it in large quantities and freeze to enjoy all year. I have seen several garlic scape pesto variations online, so you can experiment with different nuts or even make it vegan. Garlic scapes can be used in place of garlic in nearly any recipe (well, maybe not spaghetti sauce). When we get "too many", I will cut them up and freeze in small baggies. I've even dehydrated scapes with good success. Other ideas: pickled, sauteed, roasted, as a seasoning, etc. We've tried it all. It's all good! We continue planting and weeding and growing great food. It's our hope to be done with all transplanting by the first of July. That will put us a little ahead of schedule. And will alow us to move on to other projects, mostly more weeding. Crazy weather last week. We went from two nights of freezing temperatures - to our hotest day of the year (so far) - to torrential rains. Keeps us on our toes. Japanese Turnips - a large, beautiful bunch. Fortunately, this crop is still looking very good and "mostly" free of bugs. Chamomile - a large bag for several batches of tea. If you aren't planning on using it all soon, chamomile dries very well, in a dehydrator or even on a tray in the sun. Radishes - last of the season, the row still had several weeks worth of picking, but they all bolted in the last week and it was quite a chore to even find a small bunch of good ones for this week's share. See below - some plants are not happy with this crazy weather. Shain: "I hope the CSA members like carrots! Because I just planted another row in greenhouse 2." Tawny (Workshare): "Are you kidding? We LOVE your carrots!" And so the project list continues. We weed and clear a row of old crops and Shain goes out and plants more food. Another row for our second planting of beans is happening next. And we will repeat again for something else. Two nights of freezing temperatures earlier in the week took up some of our time. Row covers were pulled out of storage and put on the potato plants that had barely pushed up through the soil. Double row covers on sensitive crops. And regular row covers on EVERYTHING else. Good news is we didn't lose any plants. I only saw a little freezer burn to the tips of the red oak salad leaves, which we sort out as we harvest, wash, and package. It's possible some plants are stunted or delayed a little as they "rebel" against growing in this sporadic hot/cold weather. It's also possible some plants will "freak out" and bolt on us before they are fully ready to harvest. (**Edited to add that the radishes did just this. One week, still good. The next week, bolted. Boo!) We will be watching this very closely and try to harvest baby plants instead of seeing them go to waste. A lot to keep track of and tricky too. We had a small amount of dried pea seed leftover after planting this year, just enough for me to plant another round of pea shoots. The first step is to soak them overnight. Then I "plant" them according to a method I've developed over the last several months based on watching YouTube videos, asking questions, and a lot of trial and error. This warmer weather is a new factor to consider in my quest to figure out how to grow great microgreens, but it seems I have plenty of people agreeable to eating whatever I grow. Fresh chamomile + dried licorice root + water + sunshine = the best tea! I made this jar of tea with a handful of fresh chamomile. So easy and SO delicious. I have been enjoying a nice cold glass after coming in from working in the heat. Hope you are making yummy things with your share of EverGreen Farm foods. If you have pictures or a recipe to share, please send them to me. Another very busy week here on the farm! I've been so focused on getting as much work done as possible that I've often forgotten to take pictures to share. I'll try to do better. I have been posting a little to our facebook and Instagram page, so please follow me there for more frequent updates. Links are on the right-hand column on this page. In the last few weeks, we've planted more crops than I can probably remember, but I'll list some that were the bigger projects: one row each of Yukon Gold potatoes, Red Norland potatoes, French Fingerling potatoes, and Banana Fingerling potatoes. 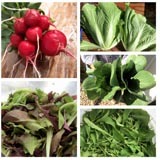 Also French fillet beans, more salad mix, basil, chard, kale, head cabbage, and more. I'm more involved with transplanting, Shain does the planting directly from seed (so I don't always know what exactly he's been up to if we are working on opposite sides of the farm). There's a lot in the ground that is growing well. We have more items to plant, but there's weeding that needs to be done to clear up some more greenhouse space. Always weeding. The salad mix is doing very well, and growing like crazy. Sometimes there's just so much "perfect salad" available that I decide it's worth the time to give a double portion in the share. Most people are happy with the extra, but if you are overwhelmed with salad greens, I bet you have a friend who would love to enjoy them. As the summer heats up, the salad mix becomes more of a challenge to grow and clean up nice, mostly becuase the bugs love it so much too. So, enjoy the large portions now while the growing is good. Heat! It's getting warmer quickly, especially in our greenhouses. This creates a bit of a challenge for us as many of our top priority projects are inside greenhouses. After a long Star Valley winter, it's almost hard to remember that it can get hot, even too hot to work. So now we move into our next stage of farming when we are racing the heat each morning to accomplish as much as we can, or harvest as much as we can, before the heat gets to us. Then we move to washing (cooling off in the water!) and packaging produce, or to weeding outside. Like we did today with the long row of beautiful camomile (as pictured above). What to do with camomile? Unless you are an herbalist, chef, or extra creative in the kitchen (which I know some of you are), most people use this herb to make tea. And it's very easy. You can literally stick a handful of camomile in a large glass jar (I use a half-gallon mason jar), fill with water, and then leave in a sunny window ledge all day. I like to add licorice root, some of the Workshares add mint. Then pour it all through a strainer and enjoy your homemade tea, warm or cold. Some people like to add a sweetener to taste. Microgreens - there was some disappointment expressed this week when people learned there would not be any microgreens in the share this week. I'm glad you love them! 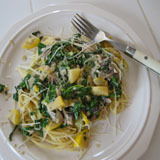 I will have them on occassion again in coming weeks, in fact, I am growing Arugula microgreens for next week's share. But I'm sorry to say they will not be grown on a large CSA scale for every week of the season. Growing microgreens is expensive and time consuming, something that was not factored into our CSA membership cost as a weekly or even regular share item. I will continue to grow microgreens as time permits, but it's more likely they will be available as an "add-on" item that can be purchased for a small additional cost when you come pick up your share.